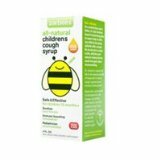 Zarbee’s All Natural children’s cough syrup, which is a blend of buckwheat, honey, vitamin C and zinc. It can be used for kids over 12 months. Our kids are fine with drinking a teaspoon of it when they are coughing because it really does work to lessen coughs. Zarbee’s was created by a pediatrician, Dr. Zak Zarbock. Hence, the odd name. We also like Maty’s All Natural Cough Syrup, which is similar in key ingredients buckwheat and honey. Maty’s also has a lot of other natural “stuff” like cinnamon, apple cider vinegar, sea salt, marjoram and even cayenne pepper. In our experience, adults like this flavor more than kids, but it does the trick as well. It’s anyone’s guess whether the extra ingredients have an effect, but I’d take Maty’s if you’re not sure you want to add Vitamin C to the mix. Maty’s does also include zinc, an ingredient unproven to stimulate the immune system. 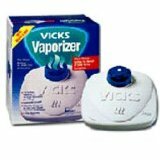 We always have used a simple Vicks vaporizer we got at the drugstore. A vaporizer boils the water and releases a steam. Usually a vaporizer will have a section for liquid vapors (such as Vicks) on top of the unit. In general, however, pediatricians will not recommend a steam humidifier because of the safety issues involved with the continuous boiling water. Most inexpensive vaporizers that you find at the drugstore also do not allow regulating the amount of steam. For cold and flu symptoms the American Academy of Pediatrics recommend a cool mist humidifier, saline nasal solution, and a bulb to suction the nasal mucus. A cool mist humidifier is preferred over a warm mist because the water does not boil. We recently tried the range of cool mist humidifiers from Crane. This is a company that has decided to differentiate itself by using fun or cool designs rather than typical medicinal white and grays. And why not? Especially when you’re sick, it’s fun to look at a penguin or a kitty rather than some strange purely functional object. Cool mist humidifiers are about twice as expensive as vaporizers. Unfortunately, they still have the same frustrations though. You have to clean them daily and the water inevitably spills after you fill them or while loading the water chamber. Ah yes, the Neti Pot. If you’re the kind of adult that suffers from multiple winter colds, you’ve probably tried the Neti Pot. It looks like a tea pot and you use it to gently pour warm water through one nostril and out the other. It does clean the gunk out, and many doctors recommend them as completely natural and safe. We’ve tried the Neti Pot from NeilMed. It’s a simple plastic pot and very lightweight, which isn’t a bad idea if you’re sharing it with kids. You can’t disinfect it in the dishwasher, but you can easily wash it with soap and water since nose gunk isn’t actually going through it. These are what we’ve found to be simple, natural and helpful during cold seasons. There’s not much you can to do stop a cold one it’s started, but a combination of these three tools can help ease the symptoms without loading a kid up on strange drugs that experts say don’t work any better than simple lemon and honey. GreatDad.com Review Policy: Manufacturers sent us samples of Maty’s, Zarbee’s and the Crane Humidifier for this review was at no cost for the sole purpose of product testing. We purchased the Neti Pot and Vicks Vaporizer. We do not accept monetary compensation for reviewing or writing about products. We only review products that we have personally tested and used in our own homes, and all opinions expressed are our own.